Have you seen „The Sword in the Stone”? Nice Disney classic, „not much plot but great for little kids.” as an imdb reviewer noticed. I concur. It’s a nice watch, it’s deeper than most Disney movies even. 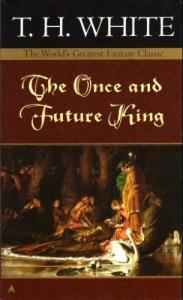 But it’s just 10% of shiny stuff taken from the top of the novel that inspired it – the first part of “The Once and Future King” tetralogy by Terence Hanbury White. A tetralogy consist of “The Sword in the Stone”, “The Queen of Air and Darkness”, “The Ill-Made Kinght” and “The Candle in the Wind”. There is also “The Book of Merlyn”, published posthumously, book that I prefer to pretend do not exist. They tell the story of king Arthur, from childhood to (spoiler alert) hist death in battle with Mordred. I fully concur, it’s a wonderful book. One of the very few that made me cry 😉 – but then, there is something truly timeless and tragic and very humane in the story of King Arthur. To me it’s a perfect tragedy: a story about how good men can make bad decisions. I shall need to read it all properly, having skimmed it in a rush in my early twenties and been very snooty about its anachronisms, what I saw as misplaced humour, and its failure to be set in post-Roman times as opposed to the 15th-century. Well, if you did enjoy The Books of Merlyn, you’re likely to like the first three books even more. They are way more sophisticated and not as bitter. Give H Is For Hawk a chance, I’d say. I have yet to read TOAFK, but this bumps it up!